One of my long-time diecast goals is to collect one of every generation of every ///M car in the eighteenth scale. Consider this one step closer towards that goal. 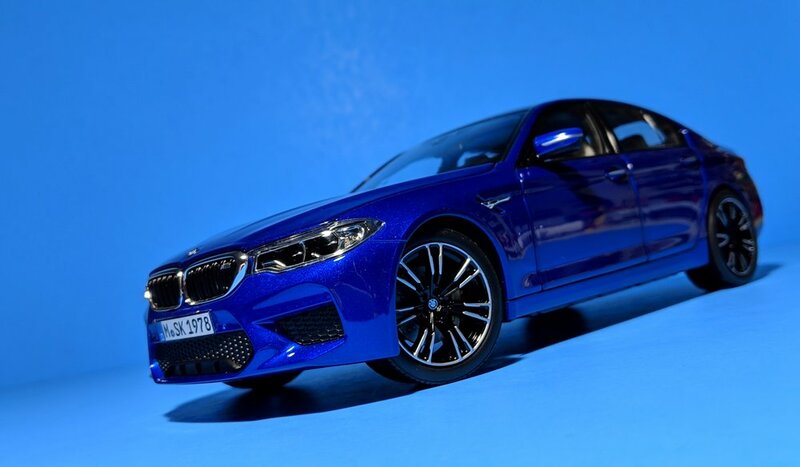 The latest M5 to prowl the streets, codenamed F90, is more or less a minor upgrade over the previous generation F10. It uses the same engine, with minor power tweaks, but offers the versatility of an all-wheel drive system. 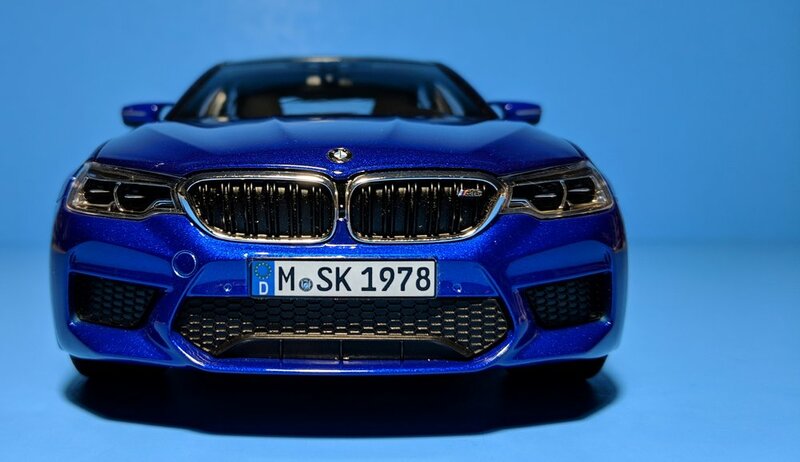 Gone is the dual-clutch transmission of the previous M5, replaced by a standard slushbox. The design of the current 5-series also hasn’t changed much from its predecessor, but this could be a good thing when you see those bloated kidneys that BMW has been slapping on its latest cars (see: 8-series and X7). Norev is one of the few makers that has stuck to the tried-and-true formula of diecast models with opening parts (for the most part), when many others in the game have shifted towards composites and plastics. Their approach to the M5 has not changed. With a metal body and opening features all around, this is a model that should have wide appeal, including the hard-to-please purists. 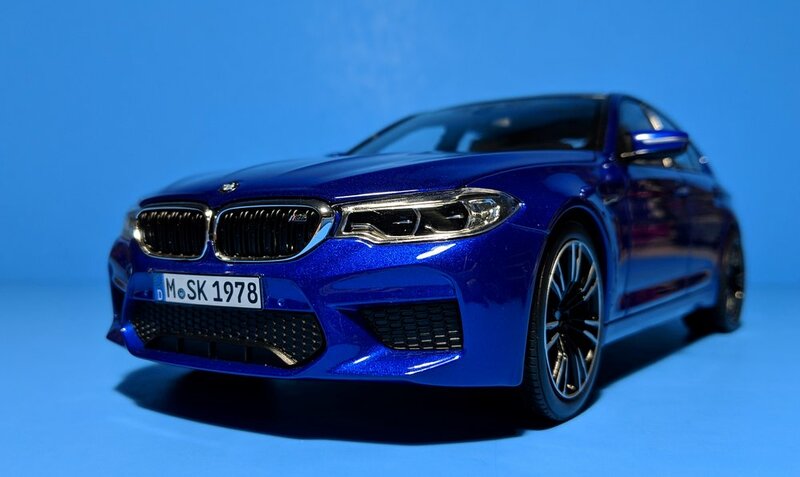 This particular example, the first and only 1:18 scale F90 M5 in the market at the time of this writing, is a dealer edition that comes in a BMW-branded box, with no mention of Norev on the packaging. Of course, with that dealer-exclusive label comes the infamous dealer-exclusive tax. There is hope, though, for collectors who want something more affordable. Norev is known for releasing exclusives first and later on cranking out standard (read: less expensive) releases in different colorways. 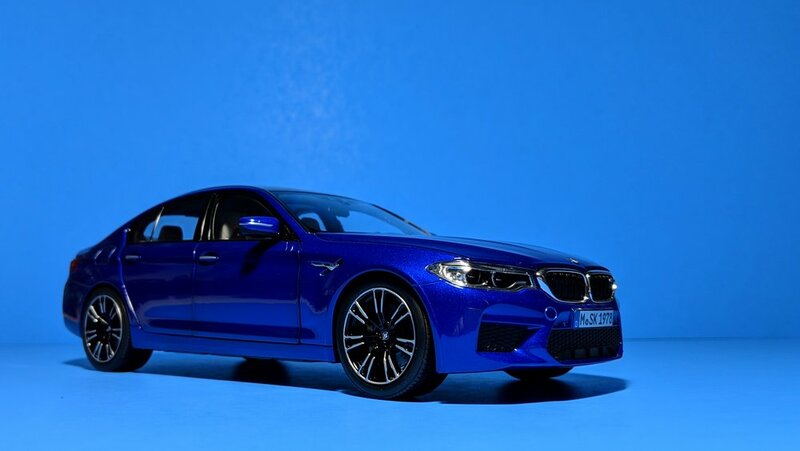 It would’ve made more sense to produce the Frozen Dark Red “First Edition” variant of the M5 first, but this F90 still stuns in its Marina Bay Blue skin. As with previous Norev models I’ve encountered, the paint quality, look, and feel is among the best - as if they stole the paint straight off the real car. I’m also convinced that they use the same application process, because the result is a polished, multi-layered shell that’s both highly glossy and sparkling metallic. The carbon fiber roof adds extra sportiness to this Bavarian family sedan-turned rocket launcher. The dual-tone 7-spokes are true to life in both size and design, and the ride height is accurate for once. These have been problem areas for Norev, but they’re getting better at them. Behind the wheels are some basic slotted rotors clamped by gold calipers. Lifting up the hood via the standard-fare dogleg hinges reveals the mass of black plastic underneath that mimics the twin-turbo V8 of the F90. As is typical for a model of this class, the front intakes are all solid. However, the Silverstone interior is where this model shines, featuring carpeted floors, seat belts, carbon fiber trim, and fully-detailed door cards, pedals, dials, and gauges. The trunk (not pictured) is also lined with the same carpeting material. In this department, the M5 easily competes with models twice its price. So, is this the ultimate driving machine? I don’t know, but it’s one hell of a model.